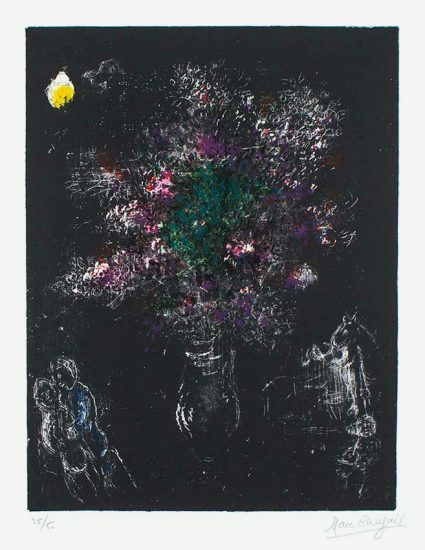 Chagall’s fascination with love is undeniable as expressed in this stunning glass sculpture Chagall Lovers, 1954. 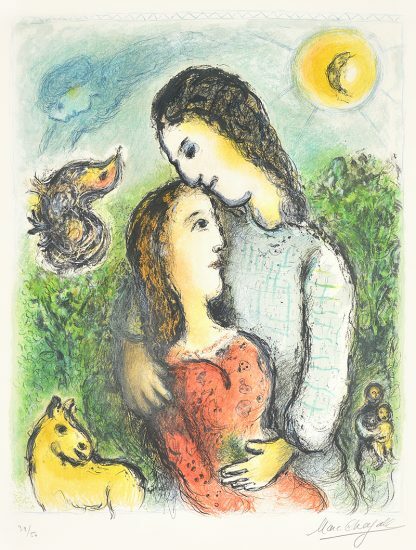 As we see in the striking details of Chagall and Angeli’s expert craftsmanship, a couple sensually embraces one another with limbs making for the handles of the vase. 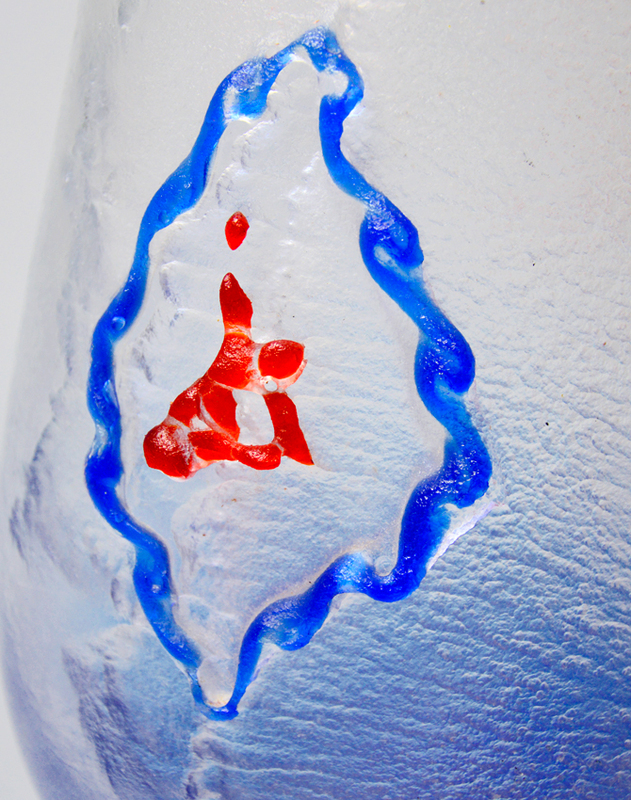 They are not very detailed, but they have been created tenderly, and this grace with which they rest in the glass gives them deep emotion. 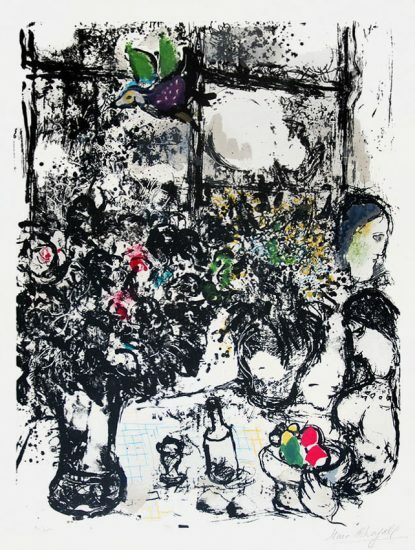 Not just emotion between the lovers, but the viewer feels the care that Chagall must have had for the glass itself. 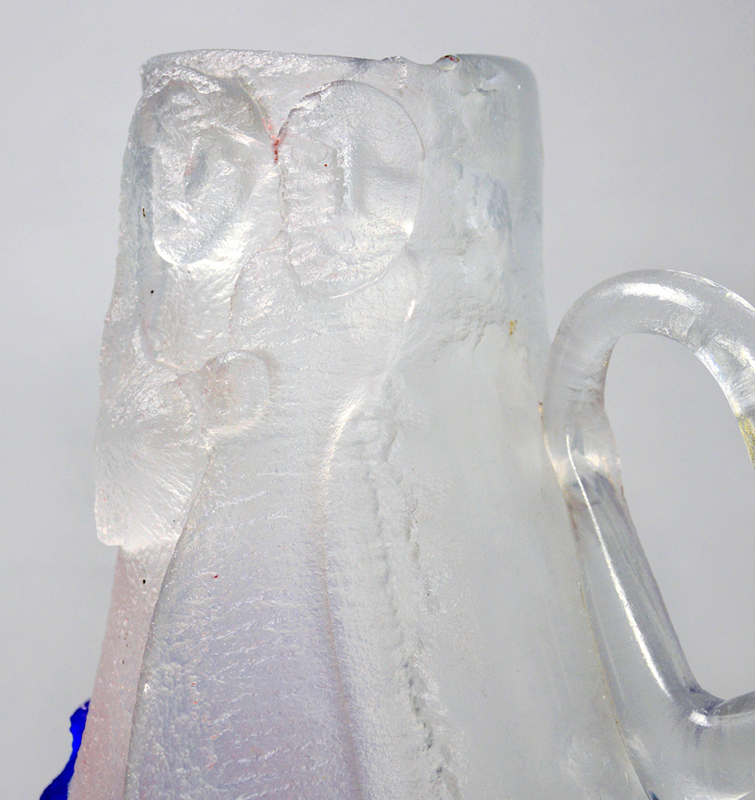 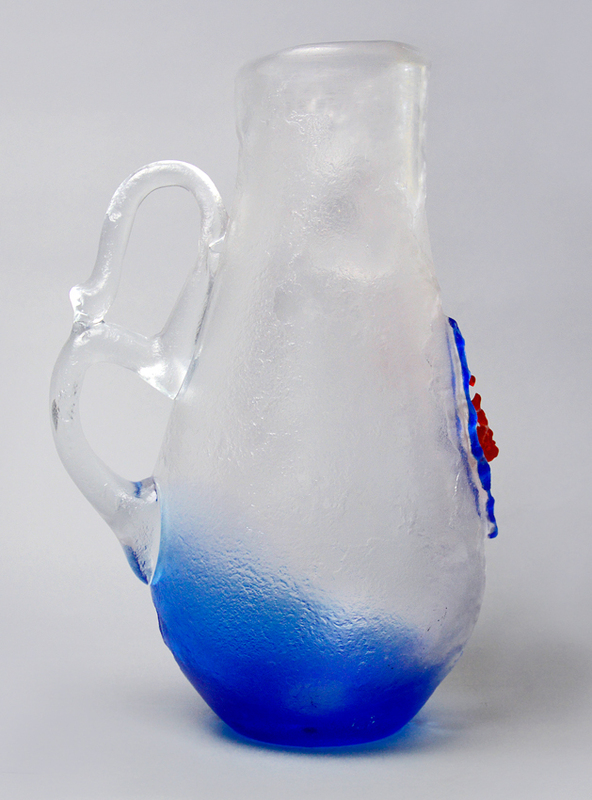 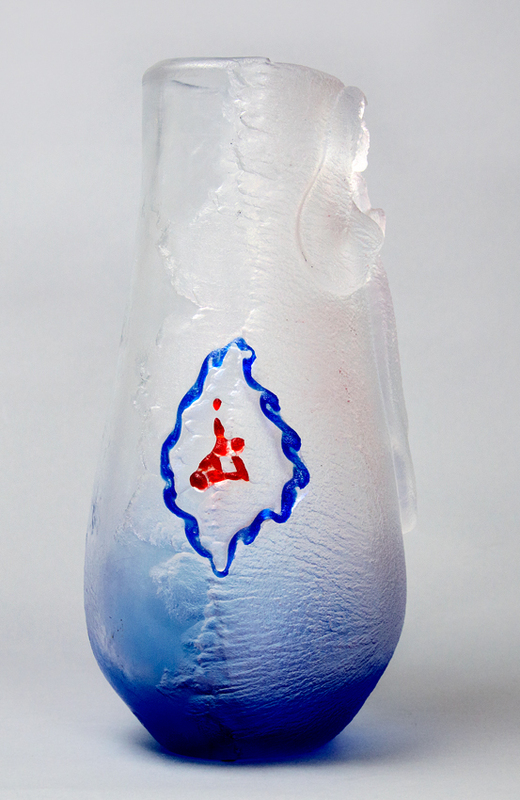 Enveloping the feelings of desire, love, and romance, the glass is clear and cloudy except for the bottom on which the blue glass transitions into the white, and the mark on the opposing side in which two lovers in red embrace each other as well. 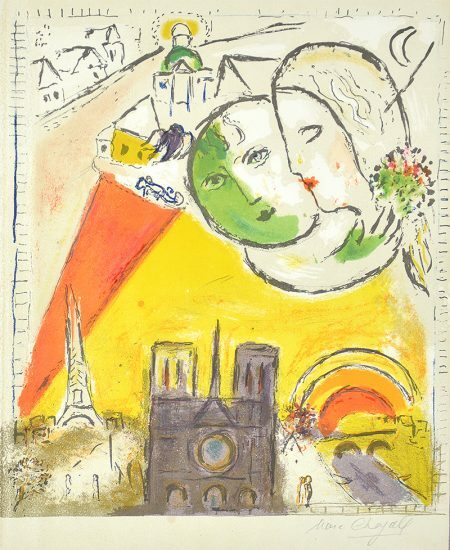 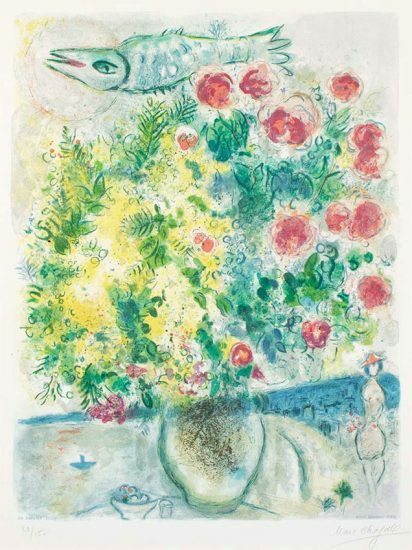 Chagall's oeuvre is a full of brilliantly colored masterpieces, and here he has managed to translate his immense talent with color into a new medium. 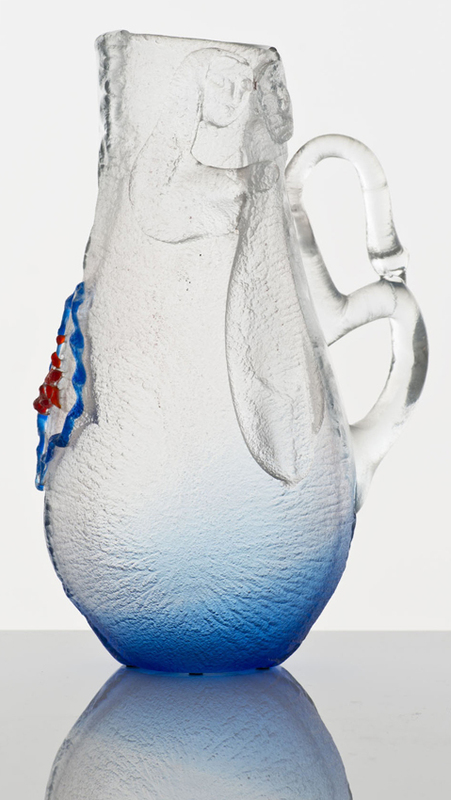 The blue and red are such full colors, that they are enough to carry the otherwise colorless piece. 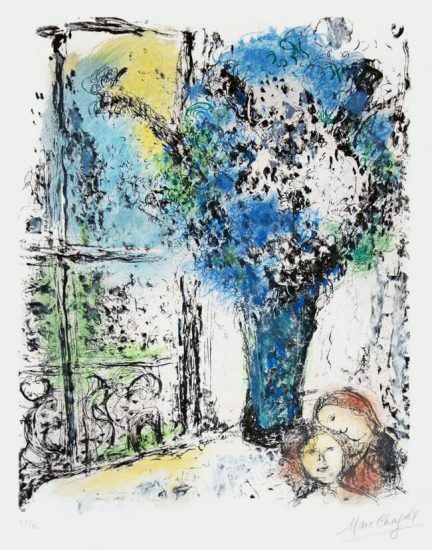 Truly, the blue color used in Marc Chagall Lovers, 1954, is familiar to admirers of Chagall's other work. 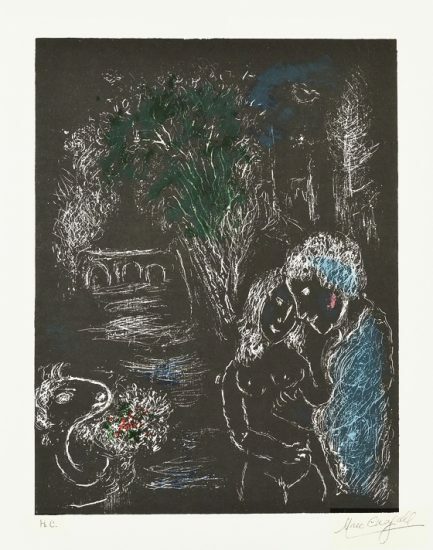 It is the same intense blue that we see in many of his most famous lithographs. 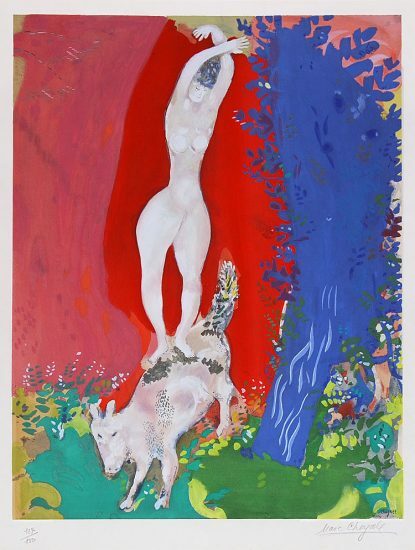 It is miraculous, and a testament to his talent, that he has created a very similar color effect in such a different medium. 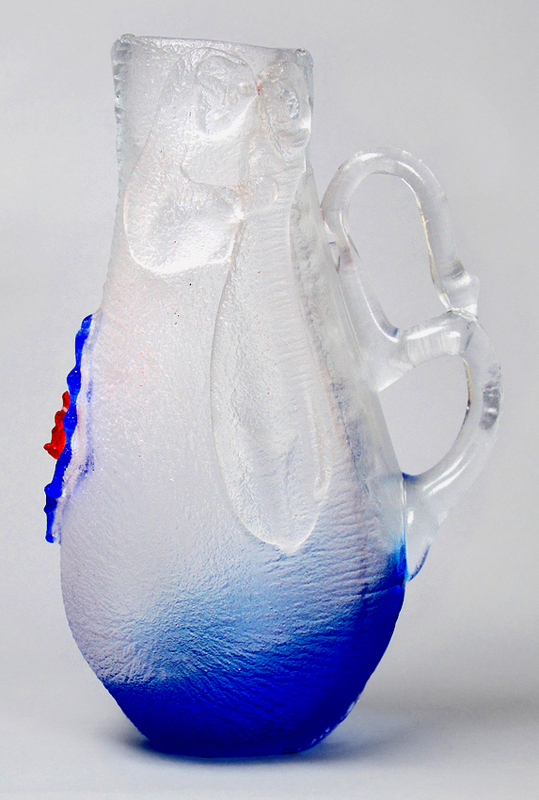 The touch of red invokes passion, and stands out on the otherwise cool-colored sculpture. 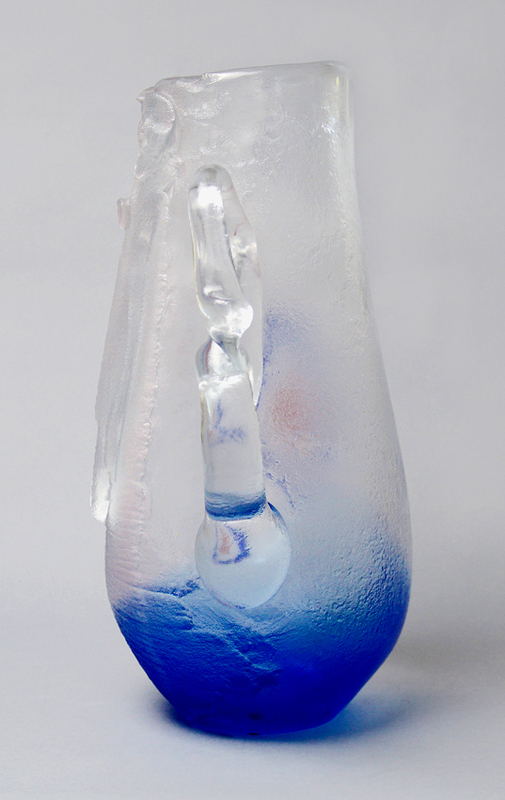 A difficult piece not to look away from, you will find yourself entranced with all the elements the vase has to offer. 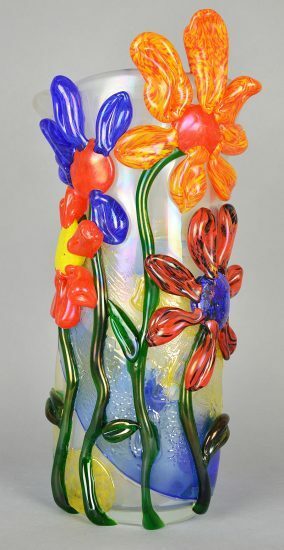 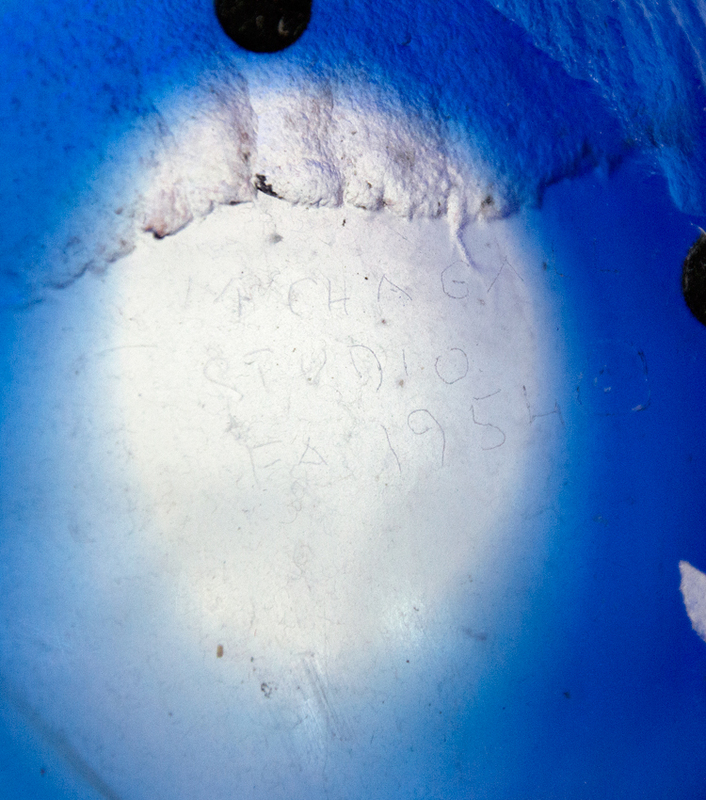 Created in 1954, this unique Murano colored glass sculpture is inscribed on the bottom, ‘Fucina Degli Angeli/Gravé Chagall Studio FA 1954.